John did masonry work on the Great Wall of China! I’ve been conducting experiments at Algonquin College! What fun. Their Masonry Lab with its specialized tools and machines all hooked up to computers is not an environment most masons ever get to play in. The textbook says X will happen. I get to test and see what that really means. Every year a prof puts me with one or more teams of students. I choose the topic, we do the work together, and they prepare a report. We’ve been doing this for several years. Our first year, we studied the effects of different types of salts (magnesium, calcium, sodium, potassium) on four concrete and cement mixtures. We expected to spend three months trying to damage our samples. Hah! It took three weeks! The weakest mortar was crumbling. The mortar that was twice as strong could be crushed under your foot, and the concrete was failing. What did we do? Twice a week we subjected samples of mortar and concrete to water, let them freeze outdoors, then thawed them with a specific salt. When we realized how quickly the samples were failing (how often do you salt your concrete step?) we stopped the experiment and rescued the samples. 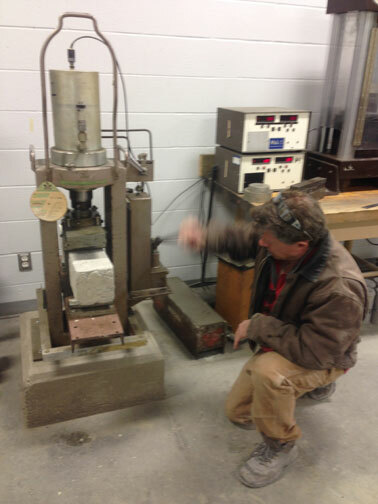 Algonquin College has this really cool masonry lab. Crushing machines connected to computers. Sifting machines. Different kinds of crushers. And so, we crushed the samples and measured the results. Short answer: don’t use salt. It’s a dessicate which helps concrete absorb more water than it would otherwise, and water can rupture concrete when it tries to freeze. Since then I’ve examined a variety of subjects within masonry. Most of them are explained in text books, but by doing them ourselves I saw the actual numbers. More than the general rule, I got to see the results. And I’ve shared that information with clients. Masonry is part chemistry and part art, and it was fun to explore the chemistry side. Some years we did three experiments, exploring additives, sealers, the effects of water, even the placement of rebar. It helps my clients to have me learn the fine points beyond what any student might find in a textbook. Copyright MyMason © All rights reserved.